MRS. BROWN RETURNS TO NZ WITH HER BRAND NEW SHOW! Presale tickets available from Ticketmaster (Auckland) at 9am Tuesday August 1st with general tickets on sale Thursday 3rd August (at 9am). Voted as the Best British Sitcom of the 21st century by the Radio Times in the UK, Mrs Brown’s Boys will make a triumphant return to New Zealand in 2018. The Multi Award Winning Mrs Brown’s Boys will perform live, their brand new show FOR THE LOVE OF MRS. BROWN. FOR THE LOVE OF MRS. BROWN is the latest production of the side-splitting series written by and starring Brendan O’Carroll. This brand new hilarious show sees Agnes looking for love using D’Internet, Cathy thinks plastic surgery might be the answer to getting that ring on her finger, Dermot realises he may need to step it up with the romance to keep his marriage fresh and even granddad has found love! Mrs Brown’s Boys success and achievements has been nothing short of incredible. With awards and accolades including four National Television Awards, two TV Choice Awards, three Scottish BAFTAs, three IFTA Awards, three TV Times Award, Royal Television Society Winner and a TV BAFTA for Best Situation Comedy to being a ratings smash around the world, Mrs Brown’s Boys live has also broken box office records across the UK and Ireland. 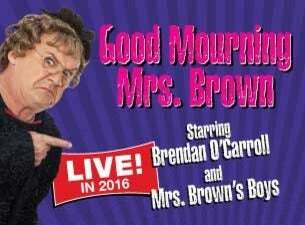 Since the Browns left New Zealand in 2016 they have kept busy with a very special Live Broadcast in July 2016 celebrating 60 years of Comedy with the BBC, Christmas Specials, a UK and Ireland Sell Out Arena Tour and Agnes’ brand new TV Chat show, All Round to Mrs. Brown’s, which attracted huge ratings earlier this year in the UK and Ireland when it aired to a staggering 5 million viewers each Saturday night. All Round to Mrs. Brown’s is currently showing on TVNZ each Thursday Night. For all Mrs Browns’ die hard fans, you are in for the biggest treat. For those who haven’t experienced Mrs Brown’s Boys live, For the Love of Mrs. Brown it is not to be missed.